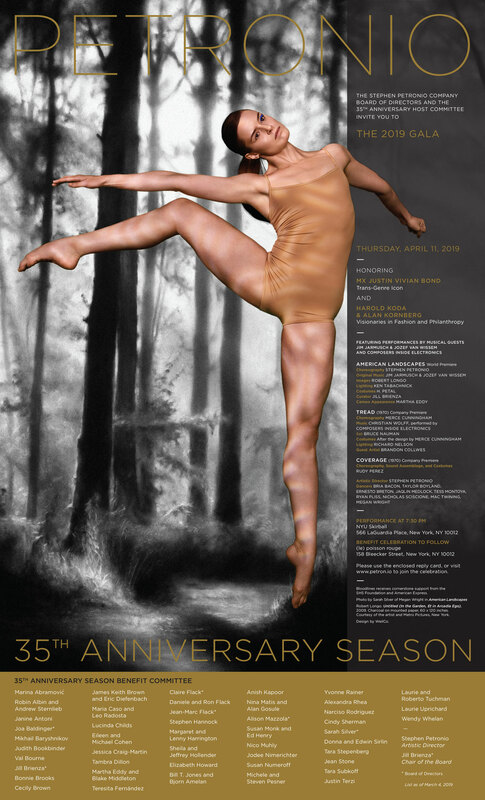 Stephen Petronio Company’s program at NYU Skirball includes the world premiere of American Landscapes by Stephen Petronio, with the musical duo of Jozef Van Wissem and Jim Jarmusch, visual design by New York artist Robert Longo, and curated by Jill Brienza. The dance is a series of shifting pastoral, emotional and social canvases that reflect the complicated beauty that coexists in these United States. The fifth installment of Bloodlines, a series of revivals of works by titans of postmodern dance, continues with Merce Cunningham’s playful Tread (1970), performed with live music from Composers Inside Electronics. Also on the program is Coverage (1970), by Rudy Perez, one of the singular artists of color of the Judson Dance Theatre and an artist largely excluded from the dominant postmodern history. The Annual Gala will be held Thursday, April 11 and includes the performance as well as a celebration. Please contact 212-473-1660 or alessandra@stephenpetronio.com for more information. ***Regrettably, due to delays with visa approval for entry into the US, Jozef Van Wissem and Jim Jarmusch will no longer be playing the music live for American Landscapes on Thursday, April 11.